Performing the Internet | The Divine Trash Strata – Ghetto Bienalle – Port au Prince. The Divine Trash Strata – Ghetto Bienalle – Port au Prince. By Nancy Mauro-Flude, November 25, 2016 at 5:22 am . In late 2009 I went to Haiti, invited to take part in the first Ghetto Bienalle – Port au Prince. I was hosted by a community of artists called Artis Resistanz – who combine Vodou culture and sculpture. 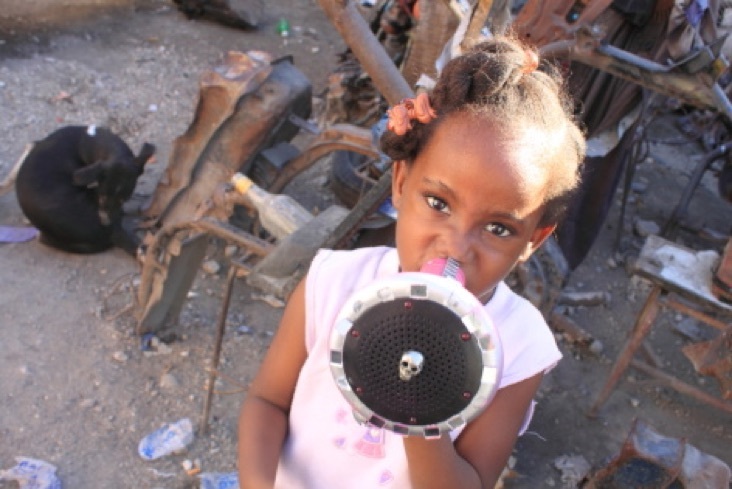 During the opening event a rectangular black plastic oil container was transformed into a video camera by the children of the Grand Rue ghetto. This performative act provided not only insight into the role of apparatus and the power of a playful dream, but by transcending its materiality – this black box fulfilled (and thrilled) the aspirations of those involved, beyond that very moment. I have just published an essay about this experience, in Unlikely – Journal for Creative Arts, Unlikely is a transdisciplinary journal, which aims to open unexpected spaces for artistic exchange and scholarly conversations across mediums, disciplines and continents. ‘The Divine Trash Strata’, features in Eds Dr Lucas Ihlein, Professor Brogan Bunt Unlikely transdisciplinary journal for creative arts. Issue 02: Field work, ISSN 2205-0027 University of Melbourne and Latrobe University. An experiment in form, Unlikely engages its audience and contributors in a two-stage process of live event, presenting creative practitioners’ works, followed by peer-reviewed electronic publication.